Ethical Traveler is a nonprofit organization, founded to “empower travelers to change the world.” Their target is to seek to use the economic clout of tourism to protect human rights and the environment. The seeds for Ethical Traveler were planted in 1996, when author and journalist Jeff Greenwald (Ethical Traveler’s founder ) wrote an op-ed for the Washington Post supporting the boycott of tourism to Burma. In the essay, he called upon the community of travelers to “vote with their wings,” and use their combined power to chastise the military government that had imprisoned Aung San Suu Kyi. In 2002, at a reading promoting his anthology “Scratching the Surface”, Greenwald was asked about Burma. A lively discussion ensued, and the idea of a travelers’ alliance to address such global issues was greeted with great enthusiasm. Krista Haimovitch, who further investigated the idea, realized that such organization did not exist. An active and respected member of the world travel community for over 25 years, award-winning author of six travel books and hundreds of articles, Greenwald was compelled to direct his passionately humanitarian voice towards creating such a traveler’s alliance. In recent years, he has been joined by a team of committed others to bring this idea to life. 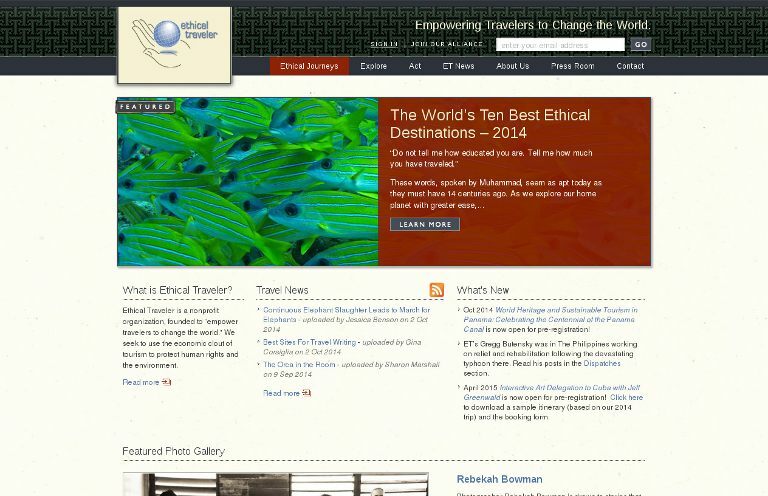 Ethical Traveler is a project of the Earth Island Institute, based in San Francisco. They maintain their own staff, and a Board of Advisors possessing a broad range of expertise in the fields of travel, environment, economy, health and world policy.